Yes! It works with kefir grains but over time they need to be replaced. A vegetable starter culture works best for coconut milk kefir. Hi Tiffany, thanks for the post. Just one question, how hot should I heat the water? 50C or 80C? Thanks! Just one more, is this then full fat coconut milk? Thank you! This is great! I love anything coconut, from the meat to the oil to the water, etc. I’ve only ever bought coconut flakes for baking, and I’m pretty sure that they were all sweetened. Are there coconut flakes that are unsweetened? Also, what are the shelf lives of the milk and the flour? I used to make coconut milk by adding a few cans of filtered water to Trader Joe’s can of coconut milk but now it seems that it is impossible to blend it completely with my vitamin. What up with this? can i make coconut milk w/ coconut flour? somehow i dont think so but do u know? Unfortunately, no. You need the oils from the shredded coconut oil to make coconut milk. If texture is not an issue (such as using the milk in some recipes baking – or for soaking oatmeal), is there any reason to strain? Can you please recommend a good quality coconut water. If making coconut water kefir, in your opinion, should I use organic coconut water? Thanks. Have a nice day! I really like harmless harvest and taste nirvana. Hi! I’m wondering if you have any coconut baby food recipes? We are going to a pacific island for 4 months with our baby twins and id like to use local products. In specific, can you use coconut flour? Something seems to have gone wrong with my flour as it seems to have developed a smell. Any help or is this normal? Thank you for the recipe, but does the heat of the water destroy some nutrients in the shredded coconut? Is there a store-bought kind of coconut milk that is good to use? I just don’t have time to make it. Your Yogurt recipe calls for “full fat” coconut milk. I have not gotten to the place I have time or equipment yet to make my own. What do I look for in the store so I know it is full fat? I have never seen anything that designates. And what if I’m not doing coconut milk? Can you use the leftover coconut meat to make coconut butter? Hiya! Do you have any idea if there are any machines that can do the separation into milk and flour? It’s so tedious using nut milk bags/cheesecloths on a regular basis ! First, let me say that I LOVE your blog and website. I’ve found it so helpful and inspirational. But I do have a question. I’ve made the coconut milk several times now, and each time, after i put it in the fridge, I end up with a solid chunk floating on the top. Any ideas why? What is it? and what can I do about it or with it? thanks so much for all of your efforts and your contributions. Keep up the great work! Hi Crystal! Yep, that happens with coconut milk and with nut milks. Heck, even “real” milk separates unless you process it or add additives to it to make it so it doesn’t separate. I usually make my coconut milk fresh and use it the same day. You can blend it again to mix the coconut cream up with the water. 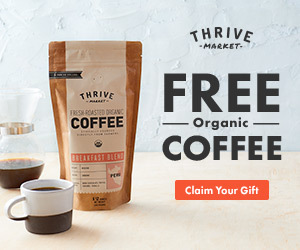 Whenever I see articles on making homemade coconut milk, it is recommend to use either canned or store bought flakes, why do you not recommend using a whole coconut? I purchase a whole coconut to make my coconut milk. There are several tools available to help with safely opening the coconut and removing the meat. 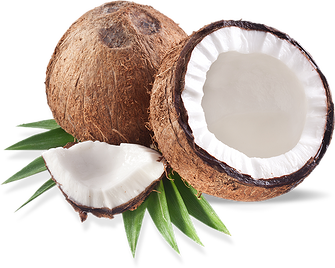 I open, drain the coconut water into blender, add the coconut meat, add water to make 4 cups, blend till smooth, strain in a nut milk bag. The milk is awesome, it does separate, but requires a swirl of the jug to mix and then you are good to go. I also dry the meat for flour. I love your site, just wondering why you don’t recommend using a real coconut. Michael, do you remove the brown skin from the meat? I made some cocnuy milk today but didn’t skin the meat, wondering if I can still use the pulp for flour, with the brown pieces in it. I’m definitely going to try this. Are there any companies similar to Tropical Traditions in Canada that you can suggest. I get really frustrated when I see so many great companies in the US but then have to pay such high shipping charges. Thanks. I’ve been making vegan soaps for almost 20 years, and I use coconut oil as one of my ingredients when making my soaps. Several years ago I also got into making my own salves and recently body butters. I came across tour website about 1 month ago, and I love it! You are very inspiring and I’m glad that I got to enjoy a part of you that you share with so many others. I honestly don’t know how you keep up with this, and your family too. You definitely have a passion for what you do. If my memory is right, you had an article on how to make soap from Coconut oil. I can’t seem to find it anymore on you website. Is it possible to put it on again? I’m so happy that I’ve found your site.i can’t wait to get cracking trying out your recipes and ideas.so lovely and different. Sincerely Sharon. I made my first batch of coconut milk and flour today. Your instructions were easy to follow and this is very cost effective. Thanks for your post and recipe. Your posts are always very insipring. I’m very interested to make the coconut flour. Do I need to refrigerate the flour? Thanks. No need to refrigerate it. It can be stored in an airtight container at room temperature. Last time I looked Trader Joes brand did contain carrageenan:( I’ll have to tried homemade! Didn’t know it was so easy:) thanks!! Awesome! 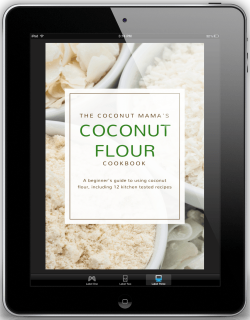 I hadn’t thought of making my own coconut flour. You deserve your own show on Cable TV. I love all your recipes & awesome ideas. I always am anxious to see what you’ve posted every day.I have my friends following you now too. Keep up the great passion you have. Its contagious. What kind of towel are you using for the second straining? I make fresh milk using freshly grated coconut and squeezing the juice out in cold water. We always made it this way when we lived in Fiji.Our people only used coconut milk and oil because in those days we did not know anything else.My mother used to make hundreds of bottles of oil and sold them in a small market. Can this be done using fresh coconut as well? Would I follow the same procedure? Would like to know as well. I love fresh coconut. I’ve been making coconut milk from whole coconuts. Love the refreshing taste of it. But the leftover pulp has not worked for flour. This last batch I got it really dry but it looks more like small coconut flakes🙁. I just tried making your coconut cookie bites and it melted all onto the parchment paper. I’m so glad I found your site. I LOVE Coconuts and I love all your great ideas. Your site is also bright and beautiful and it’s a joy to visit. I was wondering if you had any ideas for coconut candles? I’m not talking about pouring wax into a coconut shell. I want to make luxurious, deliciously scented, long-lasting, clean candles made from coconut butter. What do you think? Would that be too much of a waste of good butter? Would it mix well with other waxes? Do you have any experience or suggestions? Thank you again making this wonderful site available for us. God Bless!